Bangalore the city of gardens is captivating and has grown from an erstwhile military cantonment city with a few government and PSU organizations into a major IT hub of the world where all the biggies of the IT/ Telecom and research and development have set up their development , and production units. The site also offers a number of services that could be used by just clicking the relevant option, including booking air/ rail tickets on the site, hiring the lawyer services for working out the contract deals for possession of the new house in Bangalore. So one has the flexibility to choose anything one is looking for by choosing the available option starting from Movers and Packers to get all household stuff delivered at the new abode, choosing a carpenter to get the fixtures done. Interior Design services along with Vaastu, options could be used to arrange the layout of the house to ensure ideal Yin and Yang energies. One can also get the sofa sets, dining tables and other household furniture ordered on the set of carpenter available, house hold repairs and renovation services to carry out any changes or modifications. Also, it is possible to choose to hire services of the plumber, electricians from the site that would help making the necessary repairs or up gradation of existing facilities. The kitchen can be organized by using the Electrical/ Electronic repair services. The best features of the site are it even helps in choosing the Domestic Help and Maids from the agencies, the baby sitters to take care of the toddlers when parents are way for work. Till the kitchen is set operational, the site also offers Catering and Tiffin services to order the home cooked meals at the door step. After a day’s hard work in setting the new house if one is in no mood to cook at home a list of restaurants and Coffee shops is available to hop across for a quick bite! 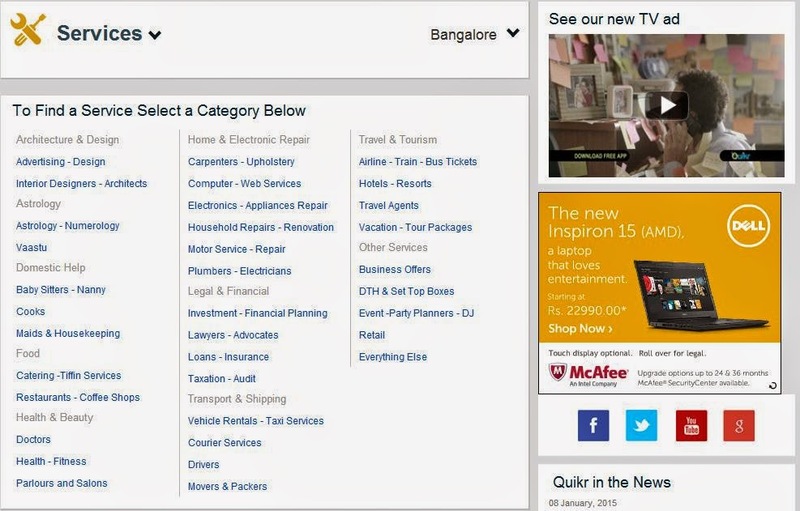 So virtually there is everything one can ask for when moving to Bangalore one can get on the site and much more as one settles in the cozy confines of the new home! PS 1. 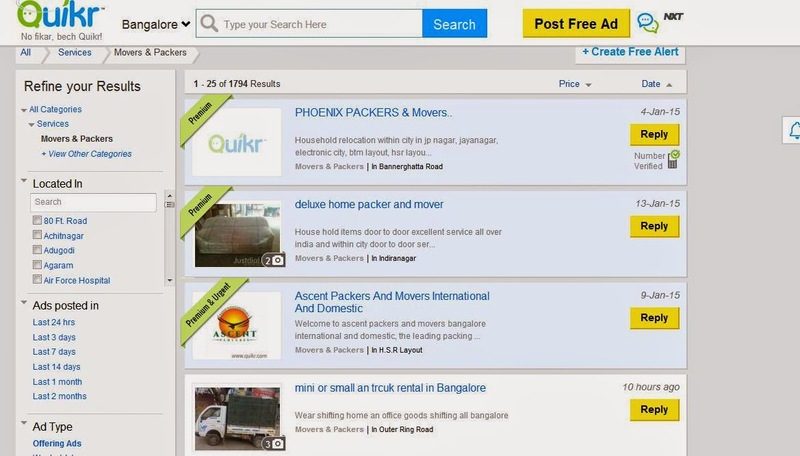 This is my entry for the Indibogger/Quickr (bangalore.quikr.com) sponsored promotion . Thanks Induji! Surely some of these sites are useful! Thanks for agreeing Mr Chowla! Such sites are modern day bliss. I didn't check the movers and packers there but as you said, they have everything one can ask for. My son also says it is the best at present! Yes, great site, it makes life easier in many quarters! Agree Padmaja! Thanks for reading! this is indeed goood.. saves on all the tensions etc..
Well researched and documented.Bangalore is one of my favorite cities but of late it is getting overpopulated & pollution levels are up.Crime is also on the rise & politicians are crude corrupt & inept. True Rama,the city has changed and lost some of its sheen for reasons you rightly mentioned! cool right? All things at one step...good luck for the contest. Thanks a lot for reading, Latha!